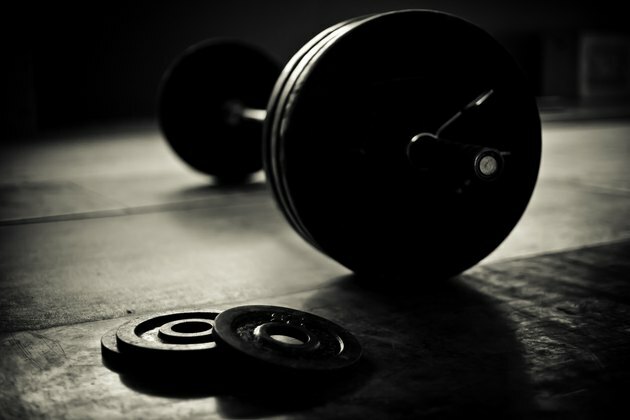 Bodybuilders, powerlifters and regular exercisers often work deadlifts into their routines. Whether to perform partial or full deadlifts depends on your lifting experience and abilities, as well as your goals -- whether you want to work the entire body or isolate the upper body musculature. Either type of lifting, if done correctly and consistently, will help provide a bigger, thicker, more heavily muscled back. Partial deadlifts, sometimes called pulling in the rack, allow a bodybuilder to choose a range of motion based on the height of the starting position. A barbell is placed on a power rack or squat rack, using pins to adjust the height. Pulling from the floor in full deadlifts requires a full range of motion, as a loaded barbell is lifted from the floor in a bent-over position. Because there is no inertia in full deadlifts, it’s often considered a true test of strength. With full deadlifts, the stress of the lift is spread out over the entire body. The first half of the movement is propelled by your thighs, glutes and hips, with the upper body muscles recruited during the second half. Partial deadlifts isolate the back musculature as they work the upper body: the erector spinae, or lower back; the latissimus dorsi, the broadest muscle in the back; and the trapezius muscles, which support your arms and help move your shoulder blades. Eric Broser, pro bodybuilder and trainer, recommends increasing deadlift poundage by starting with partial deadlifts. Set the rack pins so that you’re starting the lift from just above your knees. Lift to the standing position before slowly lowering the bar to the pins; avoid bouncing the weight off the pins to gain momentum. The first week, do three sets to failure at about eight, six and four reps. Using the same weight, sets and reps, start the lift from just below your knees in week two, and from midshin height in week three. After taking week four off, start the cycle again with a weight that’s five to 10 pounds heavier. The website SimplyShredded.com recommends that those who’ve never deadlifted start with partials before moving on to full deadlifts. Heavy lockouts are a hybrid -- similar to partial deadlifts -- in that you start with the weight on boxes positioned at knee height, allowing you to lift more. Other forms of deadlifts include conventional, or close stance; stiff-legged or box, where you stands on a platform to get a complete stretch on the descent; and sumo-style, or wide stance. Iron Man Magazine: Full or Partial Deadlifts?